* Price includes all taxes, fees and fuel surcharge. This is the Ultimate Kauai Adventure. 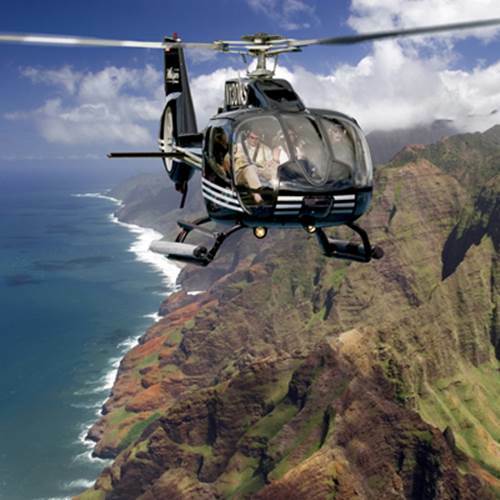 Discover the inaccessible areas of Kauai from a birds-eye view on this amazing 55 minute Kauai Helicopter Tour. How Many For First Class Seating? Upgrade To Whisper Star Open Seating? Upgrade To Whisper Star First Class Seating? 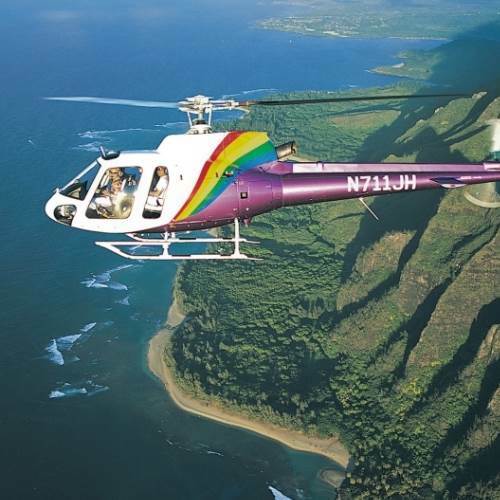 Soar above the birds on this Kauai Ultimate Helicopter 55 Minute Tour of pure beauty as you discover Waimea Canyon, “Grand Canyon of the Pacific.” Mount Waialeale known as the wettest spot on earth, the nearby Alakai Swamp, home to several rare species of plants and birds. The Na Pali Coast, with its dramatic razor sharp cliffs and the emerald green hanging valleys is spellbinding no matter how many times you see it. As you make your way north you will see Hanalei Valley and Bay. The Wailua Falls also known as Fantasy Island Waterfalls will come into view as your tour comes to an end. Learn about the history of the island from local pilots that call Kauai home. Restrictions: Helicopter weight and balance changes with every flight because of passenger weight, pilot weight and length of flight (fuel weight). It is important that we have accurate body weight from every passenger. If a standard airline seat belt is too small or you weigh over 240 pounds you may be required to purchase a comfort seat on our FX STAR. Cancellation Policy: 72-hour advance notification required for cancellation. You MUST obtain a cancellation number in order to avoid a no-show charge. Do it! I was a little apprehensive since I’d never been in a helicopter before but knowing that this is the best way to see the Waimea canyon and the NaPali coast I had to do it. We had a great pilot, Bogart, who briefed us on island history the entire time pointing out landmarks. We were inside the volcano crater with a dozen waterfalls. It was fabulous! My traveling companion and I were grinning ear to ear for hours afterwards! Spectacular way to see the island. Worth it to fly out of Princeville if you are staying out of the North Shore instead of flying out of Lihue. 70% of the island is not accessible by humans so highly recommend this. We flew after a thunderstorm and the views were breathtaking. Our pilot was funny, humble, and informative. A special thanks to these people squeezing us in at their 9am flight. We originally were with another company but had to cancel due to thunderstorms. We really wanted to do the helicopter tour so we switched to this tour and they made it happen at a time that worked for us. It was my bf and mine’s first helicopter ride. It was a truly special and extraordinary experience for us! We surprised our grown up kids with a helicopter tour of beautiful Kauai last week. It was one of the most incredible experiences of my life. We have been to this enchanted island six times, but to see it from the air was amazing, and offered a phenomenal perspective on “The Garden Isle”. We took the first flight of the day at 8:00 am, and the weather was beautiful, clear and calm. We saw Waimea Canyon, a zillion waterfalls, the beautiful Napali Coast, and best of all, we got to share that experience with each other! Our pilot was excellent, and his narration and the music played was great and set a wonderful tone for our journey. I am not a huge fan of heights, but was not the least bit fearful, it was such a lovely serene flight, and was just perfectly perfect in every way!